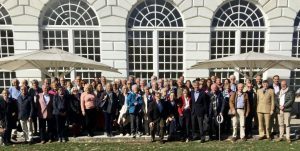 Every three years The Cutlers of London get together with our Swiss cousins, Die Zunft zur Schmiden von Zurich for a weekend of fellowship and entertainment. 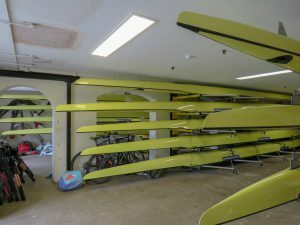 This year it was our turn to play host and a packed few days left both our guests and our members exhausted but happy! 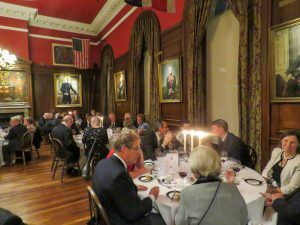 Thursday night the festivities began with an informal dinner at the Honourable Artillery Company, City Road. 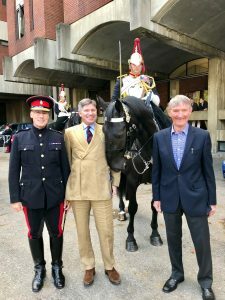 Early the next morning members and guests visited the Clerk’s old regiment – The Household Cavalry Mounted Regiment. 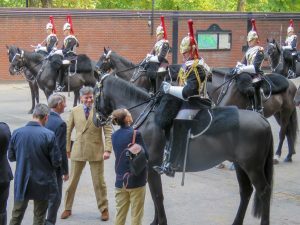 Below, the Master is pictured with the Clerk and with Major Richard Chambers, the Riding Master, whilst the members of the The Queen’s Life Guard prepare for inspection. 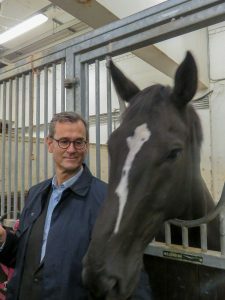 During the tour of the barracks Die Zunftmeister, Ralph Schläpfer, made a new best friend! 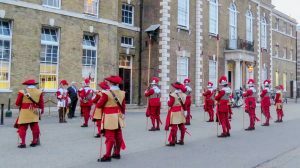 The morning also included a visit to Horse Guard’s Parade and the Household Cavalry Museum. 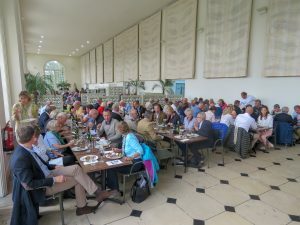 Luncheon was taken at the Orangery, Kew, followed by a guided tour of the gardens on the ‘Kew Explorer’. 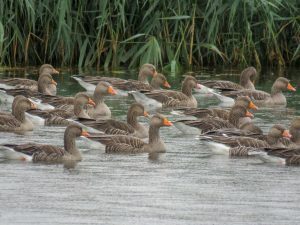 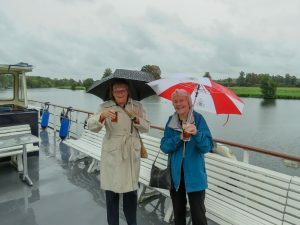 Saturday morning began under leaden skies and got worse – but thoughtfully the planners had decided to dedicate the day to messing about on the river in the Master’s home town, the very picturesque on Henley-on-Thames. 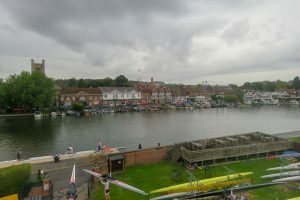 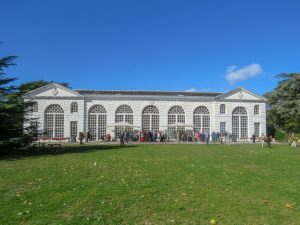 The tour included the world-famous Leander Rowing Club. 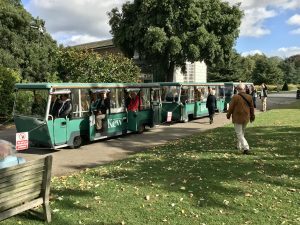 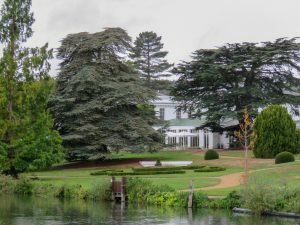 This was followed by lunch at the Henley Business School (formerly the country home of WH Smith) where the Master was a member of the faculty – and a trip on the river on board the appropriately-named, MV Waterman. 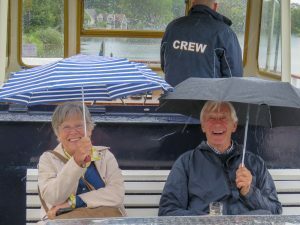 Three of our guests enjoying the typical English weather whist Richard and Janet Smith put on a brave face for the camera. 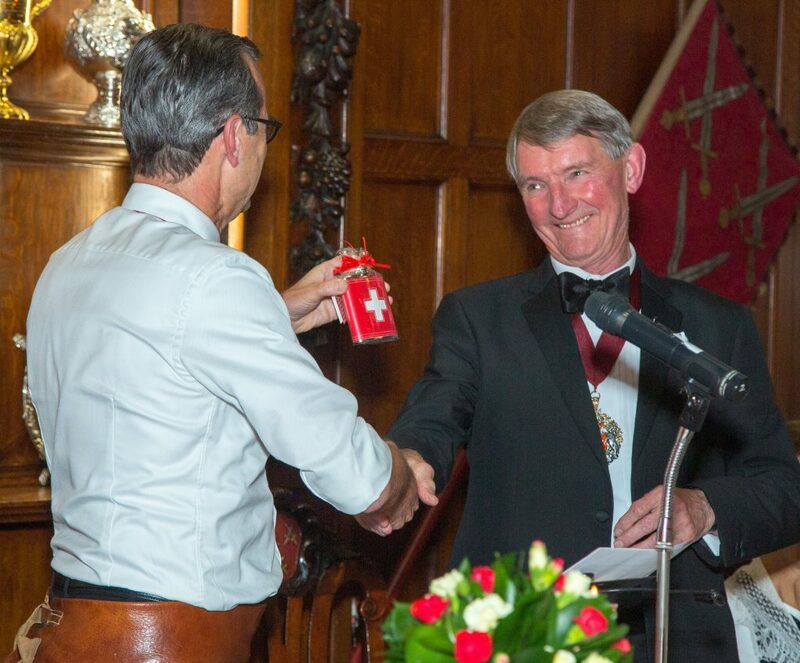 But maybe Anne Barnes and Helen Roberts had the better idea. 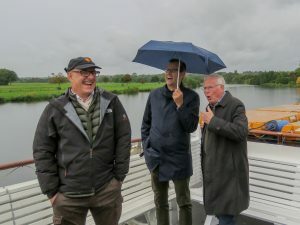 If you can’t beat the rain, join it! 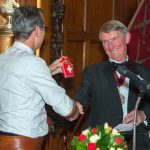 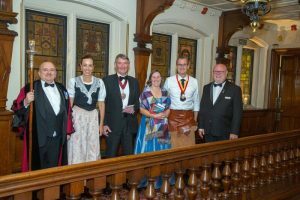 Saturday evening, after an opportunity to dry out, the Company opened its doors to our Swiss guests for a Grand Banquet at the Hall. 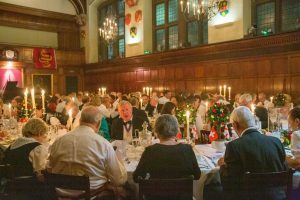 Dress code for our members was ‘black tie‘ and for the Zunft it was traditional dress. 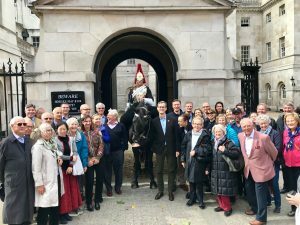 The Master and Die Zunftmeister and their ladies posed with the Beadle David Hasler and tour host Richard Shead before they processed in to dinner. 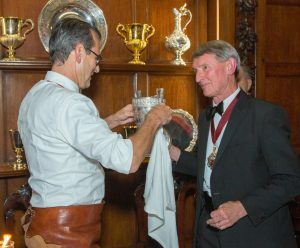 An exhange of gifts and the traditional ceremony of the Loving Cup round off a most successful visit. We wish our Swiss friends good health and good fortune and we look forward very much to seeing them again in 2021.